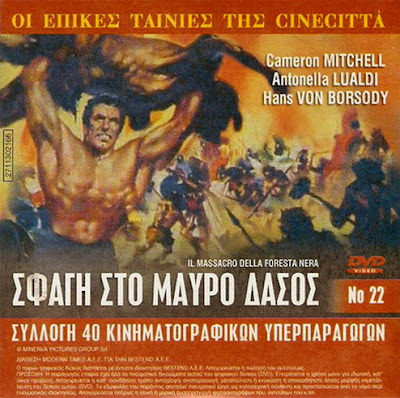 Greek DVD cover for MASSACRE IN THE BLACK FOREST. If I was a PEPLUM fan who prefers these films with bodybuilders in them well purchasing this DVD would be a disappointment. There's no muscular fellow in this film. In fact, it's one of the most serious or straightforward films from the genre. Cameron Mitchell can hardly be considered muscular. Anyway, very incorrect artwork. That looks like Sam Burke on the cover and it could be a scene from HERCULES AGAINST ULYSSES. The movie is another on my wish list and is a very good PEP. Is this Black Forest movie available anywhere?